The recent National Geographic special on the Gospel of Judas was a major media event, introducing to tens of millions of viewers one of the most important biblical discoveries of modern times. 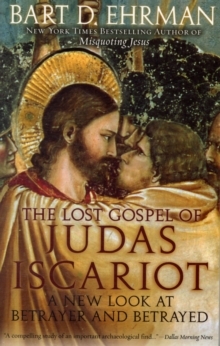 Now, a leading historian of the early church, Bart Ehrman, offers the first comprehensive account of the newly discovered Gospel of Judas, revealing what this legendary lost gospel contains and why it is so important for our understanding of Christianity. Ehrman, a featuredcommentator in the National Geographic special, describes how he first saw the Gospel of Judas - surprisingly, in a small room above a pizza parlor in a Swiss town near Lake Geneva - and he recounts the fascinating story of where and how this ancient papyrus document was discovered, how it moved aroundamong antiquities dealers in Egypt, the United States, and Switzerland, and how it came to be restored and translated. More important, Ehrman gives the reader a complete and clear account of what the book teaches and he shows how it relates to other Gospel texts - both those inside the New Testament and those outside of it, most notably, the Gnostic texts of early Christianity. Finally, he describes what we now can say about the historical Judas himself as well as his relationship with Jesus,suggesting that one needs to read between the lines of the early Gospels to see exactly what Judas did and why he did it. The Gospel of Judas presents an entirely new view of Jesus, his disciples, and the man who allegedly betrayed him. It raises many questions and Bart Ehrman provides illuminatingand authoritative answers, in a book that will interest anyone curious about the New Testament, the life of Jesus, and the history of Christianity after his death.